Switching from a Galaxy phone or other Android phones to iPhone? Do you want to move content from your Android phone to iPhone? Tipard Phone Transfer can seamlessly transfer your contacts, photos, videos, music and more from your Android phone to your new iPhone 6. Make an easy switch to your new Apple smartphone or tablet. 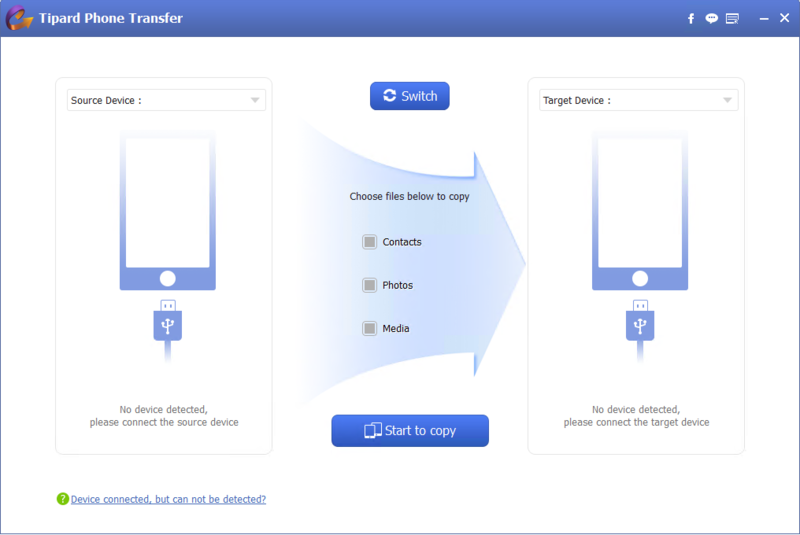 Also, this phone to phone transfer can help a lot when switching from iPhone to Android. It can transfer data from iPhone to Android. The Phone Transfer software supports the latest Android and iOS devices, including iPhone SE, iPhone 6s/6s plus/6/6 plus, iPhone 5s/5c/5, iPad Pro, iPad Air 2, iPad mini 3, iPad Air, iPad mini with Retina display, iPad 4, iPod touch, Google Nexus 6, Samsung Galaxy 6/Note 3, HTC One M9/M8, Moto X, LG G3, Sony XL39h, Asus ZenFone, Huawei, and many more. With this powerful software, you can easily handle any mobile data transferring issue.